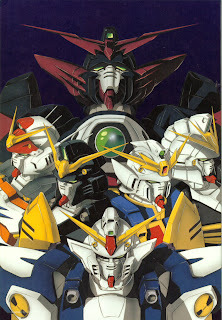 Gundam Wing, where do I begin with this one. This was one of the shows that changed the face of anime in North America drastically. The Mobile Suit Gundam franchise has been a huge success in Japan since its insurgence back in 1979. The series has taken off and had a number of sequels and spin-offs. Gundam Wing is one of those spin-off series. 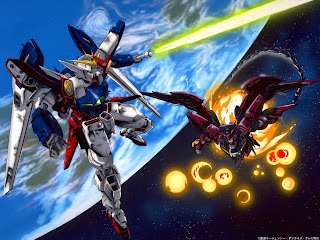 Other than the fact that Gundam Wing has pilots with mobile suits called Gundams and people living in space on colonies, the show shares no real connection with the original Mobile Suit Gundam story. The story for Wing takes place during After Colony 195, which s well after the One Year War from the original. In this series, the Gundams are piloted by 5 mysterious pilots, all originating from different space colonies. Each of the 5 Gundams was created by a scientist from these respective space colonies. The Gundams are sent to Earth with the pilots to change the war between the Earth and Space Colonies into the Colonies favor. I won't go an spoil the story for you by disusing every last detail, mostly because this was a really good series and can be appreciated a lot more when you go into it without knowing all of the details. The only thing that I will say about the story was that it seemed a little one sided with regards to characters. There were 5 powerhouse Gundam pilots and only Zechs as the powerhouse for the Earth Forces. This made the show seem a little unbalanced. The other elements of the show were well done. The animation was very clean considering the show was animated in 1995. The music used was also very well utilized. I am very drawn to the intro theme, "Just Communication" by Two-Mix. Another strong element to the show was the lack of filler. Even though the show is long at 49 episodes, I did not find myself watching a number of episodes to have to get to the point. This is very important when watching a long series like this. Many of the newer anime tend to put too much filler in and the show becomes monotonous. I personally found that I was not deprived of story content or action with this show. As a huge fan of Gundam, I am a little biased so of course I will recommend this show to everyone as a masterpiece. 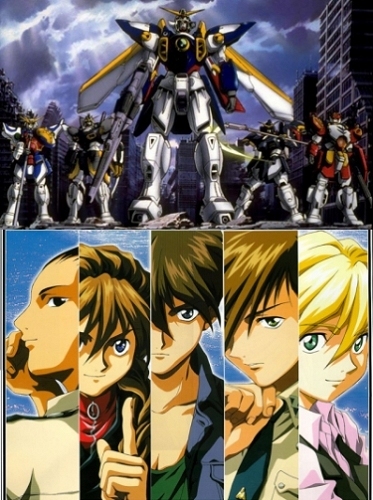 While attempting to be objective for a moment here, Gundam Wing would be best suited to audiences who are fans of mecha, enjoy having thought provoking themes introduced with regards to the ideas of war and life, and can sit through 49 episodes with no problem. If this sounds like you, then I would suggest adding this great series to your collection! One of my favourite newer Gundam series. The Gundam designs are quite different from the other series minus X.
I did enjoy this one quite a bit, and as you know Super Ksian, we grew up on this one. Although of the newer series I would have to say that I was more a fan of Gundam Seed and Wing. Wing just seemed too unbalanced with the way the factions were broken up. It was 5 Gundams against thousands of mass production Mobile Suits. There was a little too much of the immortal complex coming out when it came to the strength of the Gundam pilots. I was very interested by the concept of automated pilot suits though near the end of the series. Brought up some interesting issues that we are experiencing in the real world with regards to autopilot combat computers. I love this series. I grew up watching it on Toonami in the 90's and the animation was done neatly. Even though I was young about 8 or 9 years old. I understood the concept of the series which may have been simple but, passable. I realy enjoyed the series, my favorite character is Duo Maxwell and his Gundam Deathsythe Hell, with its batwings and beam sythe. But overall Gundam Wing series is pretty awesome. I added it to my favorite anime collection! I'm sure I'll lose some popularity over this but my favorite character in the show was Trowa with Gundam Heavy Arms. Trowa is a loner in the show which is why I find his character so interesting and Heavy Arms is a power house very much like Buster Gundam and Gundam Dynames.